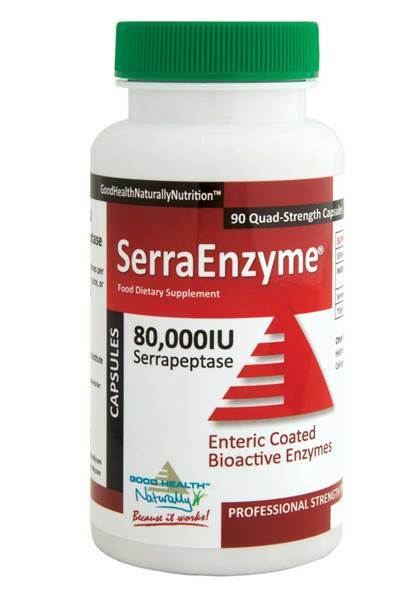 Good Health Naturally Serra Enzyme™ - 80,000IU - serrapeptase dissolves non-living tissue and inflammation in the body. I was born with cerebral palsy, and I was treated by a succession of doctors, surgeons, and therapists of all kinds. By the late 1990s, the cumulative effect of the wear and tear, caused by cerebral palsy to every system of the body, combined with years of toxicity from prescription medication had begun to overpower me and to send my health into a relentless downward spiral. My life had become a fight for survival. In 2002 Good Health Naturally, introduced, Serra Enzyme™, the original and now most widely used Serrapeptase throughout the world. In January 2006, I took Serrapeptase for the first time, sat back and waited for the results. I did not have to wait for long. Within just 48 hours, my lungs began to clear and over the following few days my lung capacity improved and stabilised. In the following weeks, my heart rate returned to normal and stabilised. My digestive system also returned to normal. Before the end of February 2006, I was able, under the safety of medical supervision, to stop taking all my prescription medications, and I have not needed them since. The improvements have been maintained and the progress continues to this day. By November 2006, my eyesight and visual perception had also begun to improve. My eyesight is now within normal range. My remarkable return to good health is a story, which I have called My Serrapeptase Adventure. I could not image life without it. Serra Enzyme™ tablets and capsules are enteric coated and are taken on an empty stomach to ensure that they are activated in the small intestine, rather than in the stomach. There are no known side effects or interactions with any prescription drug or other supplements.